The stress of daily life can have a devastating effect on our bodies which, if left unchecked, can escalate to chronic conditions like high blood pressure and coronary heart disease. A high-stress lifestyle decreases our quality of life and jeopardises our health. Therefore, finding a way to de-stress and calm the mind and spirit isn’t a luxury. It is essential to good physical and mental health. No wonder a growing number of Westerners have adopted a meditation practice. Meditation is a state of mind designed to help us connect with ourselves. The mind becomes calm and focused. We let go of disquieting thoughts and nagging anxieties when we enter a meditative state. Most of us would be thrilled to gain the restorative benefits of meditation. Yet, many of us find it difficult to sit still and quiet the mind. Perhaps you want to try meditation, but you’re not sure where to begin. Maybe you’ve tried meditation in the past without success. Like most goals, reaching a meditative state requires focus and repetition, and there is no single “correct” technique to achieve it. Remaining quiet and still during a stationary meditation practice sets the stage for us to attain a thoughtful, reflective state of mind. However, focused activities like tai-chi, aikido and hot yoga provide alternate avenues for achieving the same end while delivering outstanding mental and physical benefits. Researchers have studied what stress is and whether yoga and meditation alleviate stress by monitoring the cortisol levels, heart rate, blood pressure and self-reporting of practitioners. Whilst more studies need to be conducted, there is mounting scientific and anecdotal evidence that yoga and other meditative practices produce positive mental health outcomes—including relief from anxiety and stress. During a static meditation practice, one will often sit still, cross-legged and eyes closed, to create the perfect conditions for achieving a meditative state. In moving meditations – such as hot yoga – this is achieved by focusing on the postures or asanas, an ideal solution for those of us who find it difficult to sit still. When we enter the heated room, our mind becomes calmer and more focused. We step onto the yoga mat and move into our opening breathing exercise. Our lungs are filled with fresh oxygen as we focus on proper breathing technique. We let go of the stress of the day: traffic, a disagreement with a co-worker, what we’re going to make for dinner. As we move through the asanas, we engage fully with the practice, focused on the alignment of the spine and the proper positioning of each body part. We become more attuned to our bodies and strengthen our resolve. When an asana is challenging, a lack of mental focus causes us to fall out of the posture. Approaching each posture with an emphasis on precision boosts our concentration and heightens our awareness. Awareness is the knowledge of what we can and cannot control. Through our moving meditation practice, we apply our minds to that which we can control. We stand on one foot in the eye of the hurricane. Yet, we experience calmness and a state of inner peace. The challenges presented during the moving meditation of hot yoga serve as a microcosm for the challenges of daily life. The heat is an example of the aggravating things in life we are unable to control—the weather, the traffic, the price of fuel. However, we can control what we think of them. More importantly, we can choose to focus your concentration and efforts on outcomes we can affect. 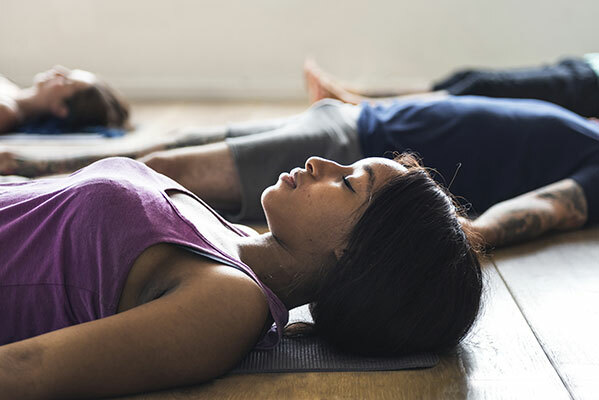 The breathing exercise performed at the very beginning of the class forces us to focus on proper breathing technique—a skill that provides physical and mental benefits throughout the day. The postures require us to focus on precision movement and careful alignment of the spine. Choosing what to pay attention to is a skill developed with practice. What we give attention to is our choice and our world. The command of our attention becomes more honed with practice. Pay attention to your breathing and the smallest details of your alignment in each posture. Doing so on the mat in class increases your ability to recognise what deserves your focus and attention and what to let go of in your daily life. On the mat, we let go of the anxiety of daily life as we transition from one posture to the next, focused on our breath. We ignore the heat and concerns over whether our asana is as “perfect” as the person on the mat next to us. This puts us in the right frame of mind to achieve a focused, calm meditative state that yields excellent mental and physical benefits. Best of all, our moving meditation empowers us to navigate our hectic lifestyles. We learn to focus and calm the mind. We move toward our goals despite challenging obstacles. We tap into our deeper reserves and connect with our inner strength rather than operating on the surface. This prompts us to focus our efforts on taking positive actions rather than collapsing under the burden of that which we cannot change. Living a hectic, fast-paced life can be stressful and have a negative impact on our mental and physical health. Meditation allows us to block out the noise, distractions, and anxiety that are often part of daily life. A seated, still meditation practice alleviates stress and calms the mind. However, seated meditation isn’t for everyone. Moving meditation like tai chi and hot yoga produce calmness of mind while also delivering countless health benefits for the body.